Organize your shower area with this durable pole caddy. Its 4 shelves provide ample storage for a variety of bath and shower essentials. No need to worry about corrosion - its high luster, chrome finish easily withstands daily shower use. Fits ceiling heights up to 8 Ft.1 In..
Transform wasted corner space into useful storage in the shower and say goodbye to rust with the Zenna Home NeverRust Aluminum Tension Pole Corner Shower Caddy. This shower pole caddy is made of strong, lightweight and rustproof aluminum, and is guaranteed for life against rust. The caddy's four large "bucket-style" shelves provide enough storage for a typical family's shower item needs. The shelves are removable and their height is easily adjusted with a thumbscrew that simply slides up and down as needed. Hooks are provided for washcloths and poufs, and razor storage is built-in, too. The exclusive TwistTight pole allows for easy installation in standard tubs or showers, with no drilling, no cutting and no tools required. The caddy fits into tubs or showers up to a standard ceiling height of 9 feet. Organize your shower accessories with this Metal Shower Caddy in Chrome that features 3 shelves, a bucket, hooks, a towel bar and razor storage to keep all of your bathing necessities within reach. Organize your shower with this rust-resistant sturdy pole caddy. This Premium Metal Pole Shower Caddy in Chrome and Brushed Nickel has 3 adjustable shelves. It also has space for razor storage, a towel bar and 1 bucket for maximum storage space. 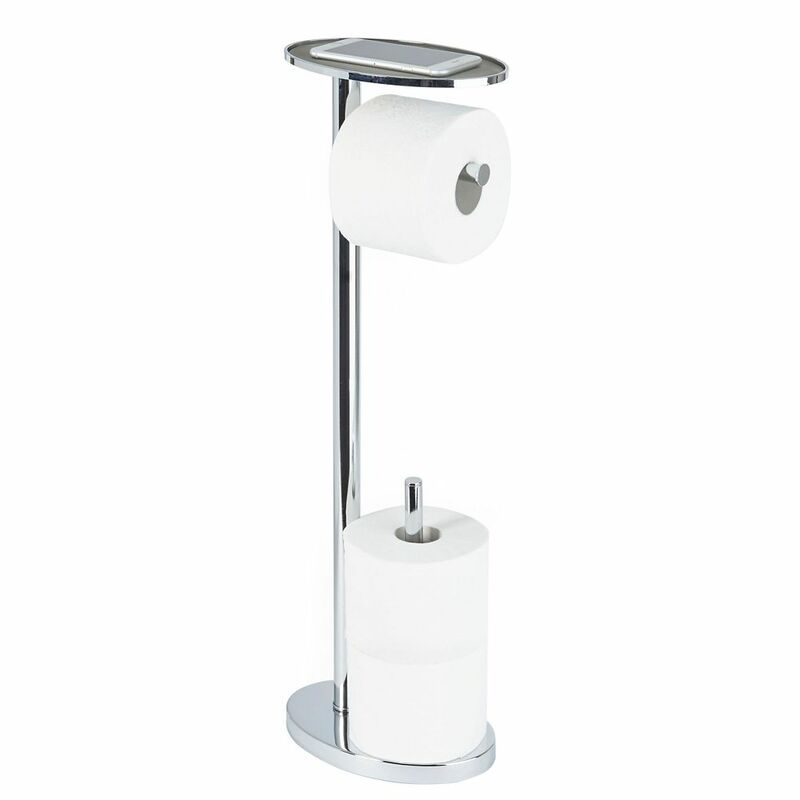 OVO Toilet Caddy Chrome The OVO Toilet Caddy is the ultimate toilet tissue dispenser. It includes a tray for your electronic device or personal wipes and storage for two additional tissue rolls, all in one contemporary, streamlined caddy! OVO Toilet Caddy Chrome is rated 3.0 out of 5 by 1.